SunFest was first started in 1982. 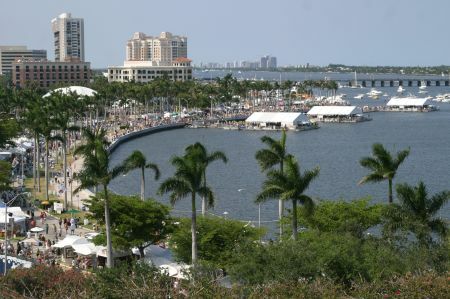 It bills itself as Florida's largest waterfront music and art festival. Every year almost 270,000 people crowd into downtown West Palm Beach for the fun. The next SunFest is May 2-5, 2019. The activities all take place along the Intracoastal Waterway on Flagler Drive between Banyan Boulevard and Lakeview Avenue. The activities stretch from Thursday through Sunday of the first week in May. Dozens of musical groups, some of them big time, perform on stages throughout the festival location. For example, some of the groups performing in other years have included Gregg Allman, Earth Wind & Fire, Styx, Preservation Jazz Hall Band, Hootie and the Blowfish, Lisa Marie Presley and Ziggy Marley. A juried fine art and craft show displays the products of more than 165 well known artists. Exhibits include jewelry, painting, pottery & ceramics, photography, sculpture, wood, arts and crafts, and more. Artist demonstrations are given on Saturday and Sunday. The grand finale of the week is a fireworks show on Sunday evening. Every year a different artist is selected to create the event's commemorative poster. Prints of the poster are available at the event and the proceeds go back into producing future events. The event is organized and produced by the community, and directed by a private nonprofit organization. They have lined up more than 100 corporate sponsors and are also assisted with funding from local tourist development and cultural councils. The State of Florida also pitches in. These efforts mean that the event is always well managed and a lot of fun for the entire family.